It all started in 2001 when 390 000 people decided to challenge the religious census in England in Wales by declaring themselves as jedis. 16 years later the Church of Jediism, spearheaded by Daniel Morgan Jones, is fighting to be recognised as an official religious organisation, despite facing resistance from public bodies in the UK. It's 10:45am on a Sunday in Bristol, in the year 2042: "Rey, Han, grab your lightsabers. We'll be late for mass." A family of four walk to Gloucester Road clutching their lightsabers and dressed in capes, where they meet a handful of neighbours dressed the same. The scene feels strangely dystopian, like an episode of Black Mirror. Whereas it's usually the other way around, the fantastical world of cinema has just been transformed into something real. Jediism is a movement that elevates the fictional characters from Star Wars to a moral and spiritual status. Halfway between a Buddhist monk and a samurai, these individuals aim to fight the darkness of the universe using their inner light. Through their mystical powers, they bring order and peace to a universe corrupted by power. The origin of Jediism goes way back, before the idea of something going viral even existed. A 2001 campaign in Wales and England convinced 390 000 people to write "Jedi Knight" on their official census entries where they were asked to state their religion. Six years later, in 2007, Jediism began taking shape as a movement. Today, the Church of Jediism has launched their new website where the philosophy of the movement is explained, and curious padawans can find any and all information. But can Jediism actually be considered a religion? The movement's website offers a vague answer to this question: "Whether or not Jediism is a religion is a choice you must make for yourself, even if this choice might be irrelevant, since it's first and foremost a spiritual and philosophical movement." Nonetheless, on 7 March 2016, the Jediism movement requested to be granted official status as a religion, which was later rejected by the UK's Official Charity Regulator. The request was made by the Temple of the Jedi Order, not by the Church of Jediism: "This petition was made by a different group, a jedi-christian movement, not by us," confirms Daniel Morgan Jones, who is the face of the Church of Jediism. By distancing himself from the Order, Jones was able to continue advancing the movement. What's more, he confirmed his belief that in the future things might be different: "Our status will change in the next five years," he told the BBC. For now, the reasons why Jediism is not a religion are clearly stated in a 10 page document that was issued by the Official Charity Regulator following the negative decision, the main reason being that the Jediism movement is mostely made up of an online community lacking clarity and structure in its beliefs, principles and practices. On their official webpage, the Church summarises the principles of Jediism in five paragraphs, explaning what 'the force' means, as well as the movement's digital philosophy and its compabability with other religions, including Atheism. Jones himself admits that Jediism isn't a dogmatic belief: "We don't have strict rules, but we do follow certain philosophical concepts [...] It's a long process of learning that we need to incorporate into our lives, but not in a strict way." Jediism promotes meditation as a way to tap into ‘the force’, but it’s not the only way. The movement also dabbles in martial arts: “I think the core is mindfulness. I also practice Tai-Chi. I believe in reflection, in thinking about things. Taking the time to reflect can be a part of meditating. That’s probably one of the most important things”, says Jones. The point of Jediism is nothing more than connecting to the light side of ‘the force’. But what is the force? “There is a very dark side to the universe that’s oppressing a lot of things these days. It’s a very sensitive topic because it goes so deep that I can’t properly talk about it because you could risk your life talking about these things, these forces at play. And having the knowledge about these forces—I can help people overcome and defeat them, with practice and training and altering how you live your life and learning how you can change this dark side, without directly calling out the people in question.” In other words, the light side is the positive half of a metaphysical and ubiquitous power that the Jedi must master in order to receive the light. To this end, the Church of Jediism offers a series of online courses. These can be divided in different modules of varying levels: relaxation, living life to the fullest, creativity, etc. From the assortment of packages and training modules, only the two most basic ones are freely available to the general public. What’s more, Jones will sell his book (which will be released on the 16 November 2017 and is titled Become the Force: 9 Lessons on How to Live as a Jediist Master) for 13 Pounds a piece. 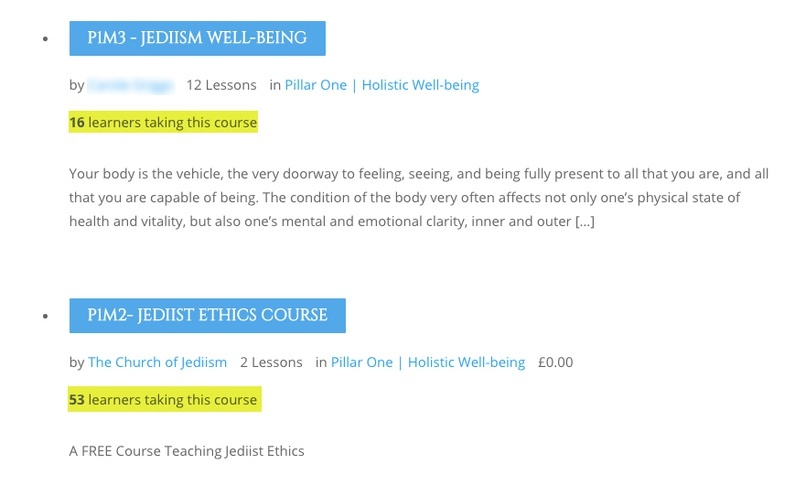 The first two online courses are free, but Jones has already indicated that the others will cost money: “There will be courses that will cost money, but if someone can’t afford these they will be able to perform voluntary work online and receive the training in exchange.” The Church of Jediism’s new webpage–launched on Star Wars Day, the 4th of May–is designed as a webshop, where registered users can buy merchandise, sort prices from low to high and add items to their shopping cart. Jones confirms that the Church survives mostly on member donations, despite the fact that not a single donation button can be found on the Church’s webpage. Neither has there been any mention of donations on the Church’s official Twitter account since 2010, the year in which the organisation petitioned to be recognised by the Official Charity Regulator in order to become eligible for financial assistance. How many Jedis are there? Sixteen years after those 390 000 people registered as jedis in England and Wales, the current size of the Jedi community is proving difficult to pin-point. Jones mentions something along the lines of half a million followers all over the world and boasts of sizeable online traffic on the Church’s website. But there’s no official data to back up his claims. The number of faithful practitioners of the Jedi Church seems marginal, at best. The webpage’s forum isn’t exactly proof of popularity either. The total number of users, both active and inactive, amounts to 56, with an even lower participation rate: the ‘welcome’ thread is the most active, with a total of seven users having written ten messages [NB. data collected 07/07/2017]. What is clearer is the number of close acolytes enjoyed by the movement, as well as their role within the organisation: “I’ve got a small team of contributors who take responsibility over different aspects of the organisation”, states Morgan. The Church’s organisational chart is made up of 18 people, each with their own role. Among them are web-developers, meditation coaches and martial arts teachers, and even experts in paranormal activities and parapsychology. There’s even an expert on the Mozart effect (the idea that listening to music composed by Wolfgang Amadeus Mozart can produce demonstrable positive effects), as well as a person in charge of marriage duties. As with other traditional religions, Jediism offers the possibility to celebrate weddings and funerals–all within the realm of their rituals–in a pragmatic way, for people who want a religious wedding or funeral with a Star Wars twist. This doesn't mean that Jones doesn't see the difference between a Star Wars fan and a member of the Church of Jediism: "You can like Star Wars, and not feel attracted to the philosophy, the same way you can feel close to the movie but be interested in the concept at the same time. The definition, in the end, is a mindset. You can be a Star Wars fan and enjoy watching their movies, and there's nothing wrong with that. Entertainment is food for the soul. But you can go deeper, and that's what we're trying to do." Jones also makes it very clear that being Catholic, Muslim or Atheist are not mutually exclusive with being a Jedi. Though admittedly, members of traditional religious movements don't hold this organisation in the highest esteem: "They say that I'm wrong, that I'm wrong and that I'm wrong, but that's something that I would never say to them," Jones emphasizes. No es el único momento en el que ha sentido cierto rechazo. El líder de la Iglesia Jedi afirma que cuando ha sido entrevistado por el ente radiotelevisivo público de Reino Unido, la BBC, los periodistas le han planteado las preguntas a la ofensiva: “Hagas lo que hagas tienes la sensación de que te van a comer", añade. Esta misma sensación también se extiende al trato recibido por otras radios religiosas. No obstante, Jones matiza que no se ha sentido realmente atacado, al menos nada fuera de lo normal. El líder de la Iglesia Jedi y los seguidores siguen su camino, decididos a vivir la espiritualidad a su manera, oscilando entre el lado luminoso y el oscuro de la fuerza. This is not the only time he's experienced resistance. The Church leader admits that, when he was interviewed by the BBC, one of the journalists asked him a question in an offensive way: "Whatever you do, you have the feeling that they undermine you," he says. That same feeling is extended to other religions. However, Jones admits that he didn't really feel attacked; the experience was nothing out of the ordinary. The leader of the Church of Jediism and his followers will continue their journeys and have decided to define spirituality to suit their needs, finding a balance between the dark side and the light.